All technical difficulties aside, we had a great time at Rothbury this weekend. It’s always hard to leave a place like Rothbury. But it feels really good to be back home so we can share all of our live concert culture adventures with you (and take a shower and sleep in our own bed). Rothbury’s music line-up this year wasn’t as stacked as it was last year but it still had its memorable moments(more on that later in the full music review–The Dead, Ani DiFranco, Brett Dennen, Nas, Matisyahu, Bob Dylan, etc.–on Ink19.) But where the music line-up might have lacked, it was the other exciting non-musical moments that picked up the slack. I had myriad moments of visual stimulation and creative escape via the art installations. And I also had the pleasure of going on an exclusive tour to learn more about Rothbury’s greening efforts. From my unfortunate steamrolled encounter with the Michigan State Police to seeing a naked couple express their love for live music in all their glory during Matisyahu’s set on Sunday, it was four days filled with loads of multi-sensory experiences and deep reflections in to the wild wonders of live concert culture. But I don’t want to pile all the fun on you all at once. I’ve decided to space out all my fan concert culture observations over the next few weeks. We’ll start with this 3 part Rothbury wrap-up here on Live Fix. A special mini-concert video by Canadian collective Broken Social Scene captured on my Blackberry as members of the band displayed the intimate beauty of simple melodies and stripped-down songwriting. The mini-concert took place in the media area backstage and I thought you’d enjoy it, too. Every festival road trip always has a few unexpected turns that can put an interesting twist on your overall emotional experience. Ours had a bit of drama of it own. We got turned away by Rothbury main gate staff when we arrived. Unexpected traffic kept us from making the 12:00am media check-in so we had to stay in a hotel for night. But I once we return the next day and rolled onto the festival grounds on Friday morning many of the same memories of Rothbury 2008 came rushing back. The tall slowly swaying Michigan pines and cotton candy fluffy white clouds made the previous night’s drama melt away as a mid-morning sound check thumped from the main stage filled. It was a perfect backdrop to set up camp. After a few bands it was time to explore one of Rothbury’s gems: Sherwood Forest. 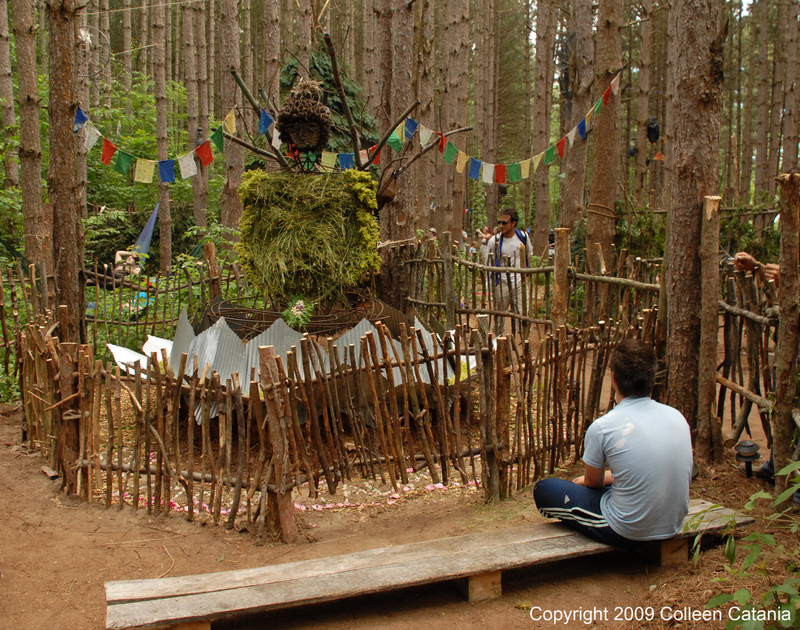 Located in Rothbury’s Sherwood Forest was “Reincarnation,” a zen garden sancutary of sorts made of recycled items and nature’s goods that were built in to, around and extended from the existing pine trees and dusty floor of Sherwood Forest. After seeing a few sets of music on Friday afternoon, my trip through the naturewalk was one of my favorite experiences at Rothbury. I marveled at the impressive and inspiring detail created from the mosaics of unlikely and otherwise mudane and ordinary things we use, eat and throw out everyday. 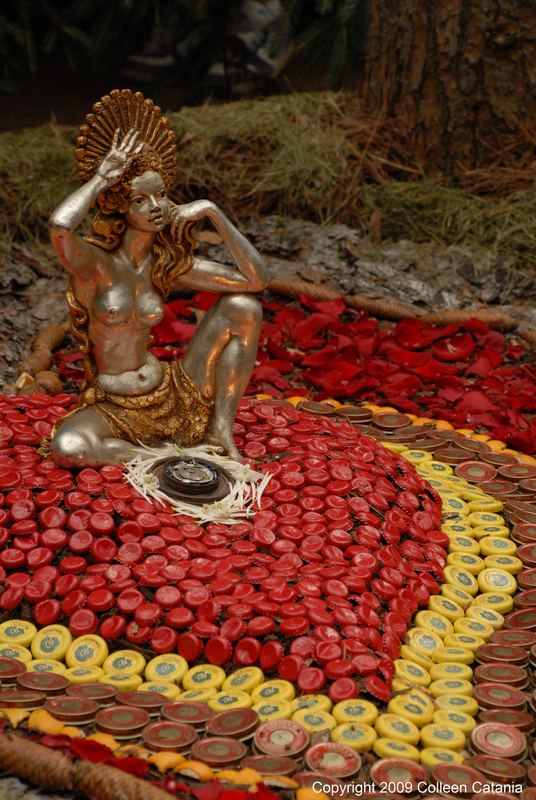 After looking closely at the sculptures made of pine needles, fruit bits, bottle tops and gears, I ventured to the music with a different perspective on the little things that make live performance so special and unique. Giving my ears a break also made the rest of the day’s music experiences that much more enjoyable and fresh. Having an opportunity to take a break from the music is something Rothbury festivalgoers where blessed with had they taken the time to stroll through Reincarnation. And it wasn’t hard to find or stumble upon. It’s location was expertly placed in a high traffic area of Sherwood Forest (with a double ended exit/entryway) so fans could see it and walk through it from both directions on their way to the next set at the main stages. Reincarnation’s outside wall was designed in a way that kept it sheltered enough so when you walked along its serene dusty path most of the outside passerby-er traffic noise sounded like a peacefully blowing wind. Reincarnation’s visionary is a California-based artist who goes by the name “Nature.” A proper moniker I told him during our brief chat about his work. Nature also expressed thoughts about the culture of the summer music festival. But we didn’t have enough time to have a full discussion as other festivalgoers were waiting to talk with him. He did, however, agree to set up a time to talk after Rothbury. And I’ll be sure to share our chat with you once it happens. Like a lot of the various art experiences throughout Rothbury’s grounds this year, Reincarnation provided an excellent alternative to the music which gave you a chance to switch senses and give your hearing and touch sense a rest from the pounding drums and bone-rattling bass. As I left the exhibit, I chuckled to myself at the bit of recycled wisdom that Reincarnation was speaking to me from the ground in front of me, telling me to “Go with the Flow” a bit more should I ever encounter another unexpected festival arrival situation like I did on Thursday night. 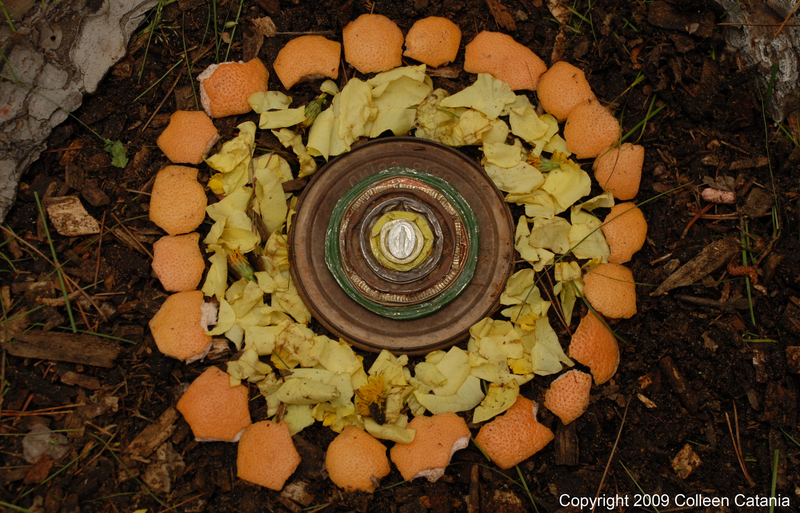 You can see more photos of the various creations along Reincarnation’s path below and on Colleen’s Flickr site. And to give you a better idea of what the vibe was like on the path, I also shot a brief impromptu video on my Blackberry Storm.